Plan of the Battle of Yorktown drawn from a French eye-witness account. An important 1787 American Revolutionary War map illustrating the Battle of Yorktown, the last major conflict of the war. The map centers on the battleground just south of Yorktown on the shores of the York River. Gloucester is apparent just across the river. Finely engraved detail is exhibited throughout with fields, swamps, roads, and houses noted. 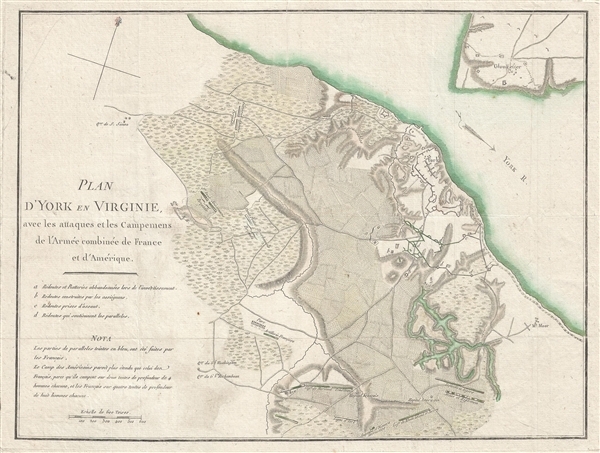 The map was most likely drawn by Querenet de la Combe, a French officer commanding the French Royal Corps of Engineers at the Siege of Yorktown. The Battle of Yorktown, also known as the Siege of Yorktown was a decisive victory by a combined force of American Continental Army troops led by General George Washington and French Army troops led by the Comte de Rochambeau over a British Army commanded by British lord and Lieutenant General Charles Cornwallis. The culmination of the Yorktown campaign, the siege proved to be the last major land battle of the American Revolutionary War in the North American theater, as the surrender by Cornwallis, and the capture of both him and his army, prompted the British government to negotiate an end to the conflict. This map is based upon a 1781 French manuscript map of the same title housed in the Rochambeau Collection (Mss. 59) at the Library of Congress. It was issued in the second edition of François Soules' Histoire des troubles de l'Amerique Anglais. The first edition, published in 1785 did not contain any maps. Apparently Thomas Jefferson, after reading the 1785 edition, approached Soules with suggested for updates and revisions. He delivered his proposed corrections in 1786, in time to be incorporated into a new 1787 edition. The new version, with Jefferson's editions was much improved with maps as well as a chapter of Jefferson's efforts to reform the laws of Virginia during the Revolution. Very good. Minor Soiling. Blank on verso. Archival verso reinforcement along original centerfold. Nebenzahl, K., A Bibliography of Printed Battle Plans of the American Revolution 1775-1795, 185. Verner, C., Maps of the Yorktown campaign, 1780-1781, XII. Phillips (Virginia) p. 61. Library of Congress, Rochambeau collection Mss. 59, G3884.Y6S3 1781 .Q41. OCLC 922643914. Cogliano, F. D. Thomas Jefferson: Reputation and Legacy, p. 45.